It’s completely understandable if you’re nervous about renting your home to holiday-makers for the very first time. Sites like Airbnb are quick and easy to use and can generate very welcome passive income. However, the downside to such benefits is that your home will be subject to the scrutiny of strangers. When preparing for your first hosting experience, you may feel you’re not ready for that level of judgment. Luckily, there are a few simple steps you can take to help calm your nerves. Here’s a quick checklist of ways to add some finishing touches to your property before your first guests arrive. By putting in the groundwork, your experience will be so overwhelmingly positive, you’ll be keen to repeat it. 1. Think like a concierge. Renting your house to vacationers is a great way to make some extra cash and perhaps, even meet some interesting people. That being said, it’s a smart idea to treat the transaction like a business deal. By seeing your guests’ stay for what it is in its simplest form, you’ll feel more prepared. Take it one step further and think about what sets you apart from other accommodation and vacation rentals in your area. What is your unique selling proposition? If you were running a hotel, how would you want to improve your guests’ experience? Customize what makes your home and surrounding area special. For example, it might be a nice idea to create a local “guide.” Include some suggestions of places to go, restaurants to visit, or other “gems” your neighborhood has to offer. Also, try to see things from your guests’ perspective. With a few thoughtful touches, you can significantly improve how your visitors feel about their stay. You might even want to leave a token gift, like a chocolate on the pillows or a nice bottle of wine. 2. Be upfront and personal – in an informative way. Clear communication is vital and will ensure that you’re completely organized. Have you discussed how your guests should collect and return your key? Will they be welcome to any food in the refrigerator? Set clear expectations and never assume that things will take care of themselves due to common sense. Make sure you mention all the idiosyncrasies of your home and any specific rules (but try not to be overbearing). It’s crucial to talk to your guests beforehand and upon their arrival. They’ll have a clearer picture of what to expect, plus it will also help to prevent any uncertainty. 3. Ask for reviews and be ready to accept some suggestions. Don’t forget: your guests chose your property. There were plenty of other options available, but you won! Don’t look around your home and feel you aren’t worthy. You took the time to create the listing – writing the description and taking the photos – and it attracted vacationers. Ask your guests to leave positive reviews for you if they were happy during their time in your home. If your guests were unhappy with anything during their stay, that’s okay. See it as a chance to improve for next time. Be sure to ask what you could have done differently to improve their experience. For some ideas to stay ahead of the game, check out these 5 ways to enhance vacation rental reviews and see how you can avoid apologies before they’re even needed. 4. Call in help if you need it. One thing that is guaranteed to affect how your guests rate and review your home is the cleanliness of the space. Preparing your property to guest-ready standards can be very time-consuming, not to mention costly, once you invest in all the cleaning supplies. Don’t fret over the details. There is quality, affordable help available. Contact us today to set the wheels in motion and ensure that every surface is sparkling when your guests arrive. You only get one chance to make a first impression and at MaidThis!, we’re experts at setting the right tone for your vacation rental. If you want to prepare for every scenario, we can help. We’re available to get your home ready before your guests arrive and can also arrange a post-visit tidy up. Additionally, our staff are trained to look for any signs of damage after your guests have checked out. We will also let you know when you’re running low on key supplies. We pride ourselves on going above and beyond to make the whole process as easy as possible. 5. Be sure to leave feedback about your guests for future hosts. The great unknown that’s probably making you anxious is the imminent review of your home or rental property. Take a few deep breaths and remember that you have the chance to review your guests, too. In the same way you want your guests to leave positive reviews about their stay with you, they will likely want you to leave a positive review about their time in your space. Give them the benefit of the doubt if there is anything that doesn’t go quite according to plan, but be honest in your review if your ground rules weren’t followed or were completely ignored. 6. Don’t forget to relax! Remember, your guests want to like you. They are more than likely visiting town to have a wonderful time. So, instead of expecting the worst, try to anticipate the best-case scenario. Try this exercise to get your mind in the right place. After a few deep breaths, take in the things about your home that you enjoy. What activities make you feel most comfortable when you’re hanging around your apartment or house? What are your favorite go-to snacks or drinks? Make an effort to highlight those things in some way. You might leave tea or coffee displayed on your kitchen counter or a list of suggestions to help your guests choose some quiet pastimes while staying with you. They might need to relax and unwind, too; and small, inviting gestures like these make a significant difference when welcoming new people into your space. 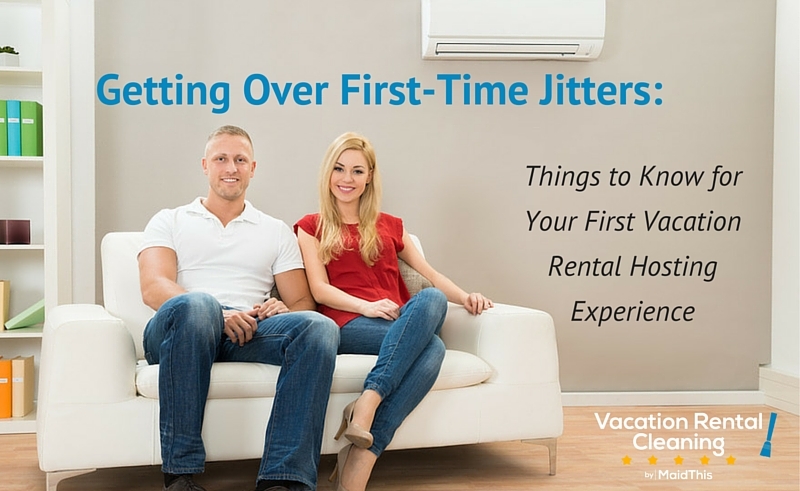 You’ll have a lot on your mind before your very first vacation rental hosting experience, but you can very easily mitigate some of that stress. By planning ahead, you’ll be ready for your next guests before you know it.